This morning, the Hurricane Irene forecast from the National Hurricane Center has held fairly steady, with little good news for New York and New Jersey interests. Irene is currently forecast (as of 5 am) to pass just to the east of NYC as a strong Category 1 Hurricane on Sunday August 28th. As before, the forecast at two and a half days lead time is still highly uncertain — one model still predicts it going over Washington D.C. and northward, and two models (of eight) predict it going far offshore, well to the east of Long Island. But the worst case scenario was spelled out in a recent post, comparing the storm to a hurricane that hit NYC in 1821. NHC now lists the chances of NYC getting very dangerous 58+ mph steady winds at about 25%, and the chances of having hurricane force (74+ mph) winds in NYC at 5-10%. However, the deadliest part of a hurricane is typically its storm surge, and even if the eye doesn’t hit NYC, we could see our worst storm surge in over 100 years. NOAA’s storm surge model (P-SURGE) is providing useful information in their 3 day forecast for our area, listing the probability of a 4+ foot storm surge at 10-20%. Depending on the timing with high or low tide, this water level could lead to overtopping of seawalls around the New York City inland waterways, and flooding of low-lying infrastructure (subways, PATH train, tunnels, FDR highway, etc.). They list the probability of a devastating 8+ foot surge below 5% (lowered, so an improvement). Stevens Institute’s two-day advance forecasts of storm surge, as well as waves and currents for NYC, NJ, Long Island waterways, are posted at about 1:30 AM daily, so look for them Saturday morning to give highly detailed forecasts for Irene’s Sunday impacts. The timing of the passage of Irene, during a new moon (Aug 29) at perigee (Aug 30), means that the spring tide range on Sunday will be one of the highest of the year. Presently, the Hurricane is forecast to approach the southern NJ coast early Sunday morning, and arriving around NYC at an intermediate or high tide (5 pm or 8 pm). 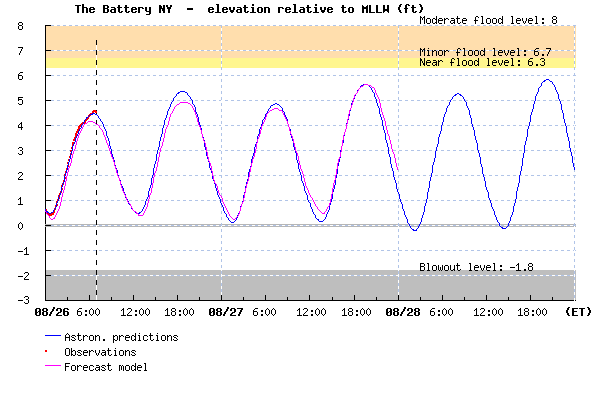 Predicted Tide (blue), observations (red dots) and storm surge forecast (magenta) at The Battery, New York City, for Saturday and Sunday August 26-28. High tides along Long Island are at a similar time, and along the Jersey Shore are about one hour earlier. Keep your fingers crossed — the exact track of the hurricane can vary by 200 miles beyond the 24 hour forecast. However, this is a large hurricane that will broadly impact the entire region. The National Hurricane Center and media warnings do not always adequately warn the public about the importance of the size of such large storms. The National Weather Service and local Offices of Emergency Management (NJ, NYC, Nassau and Suffolk counties) have begun evacuating some low lying areas and are urging people to begin to make preparations for the storm.